When it comes to smartphones, chances are you fall into one of two camps: fans of the Apple iPhone’s iOS operating system or those dedicated to the Android OS used by Samsung (among others). However, in the world of true wireless earbuds, these distinctions aren’t quite as clear, and you may well be considering buying a pair of Samsung Galaxy Buds, even if you have an iPhone – and vice versa. Now, that Apple have released an updated version of its true wireless earbuds the Apple AirPods (2019), which come with an optional wireless charging case, it's even more difficult to choose which is the best true wireless earbud model for you. If you’re not sure how to choose between the Apple AirPods (2019) and the Samsung Galaxy Buds, you’ve come to the right place; we've examined the pros and cons of both true wireless earbuds to help you decide which ones will suit you best. There’s no denying that the original Apple AirPods paved the way for true wireless earbuds to become mainstream, and despite being released in 2016, they were still among the best true wireless buds you could buy in 2019 – that is, until the new AirPods (2019) came along. Apple says that the updated buds offer "faster connect times, more talk time, and the convenience of hands-free Siri." It's debatable how much has actually changed since the originals were released, and they certainly aren't the rumored AirPods 2 we were hoping for – we're not expected them to be released until at least 2020 now. The Samsung Galaxy Buds on the other hand were released in February, and as such, are not quite a ubiquitous as the AirPods. Still, they represent a size-able improvement from Samsung’s previous true wireless buds, the Gear IconX. Released alongside the new Galaxy S10, Galaxy S10 Plus and Galaxy S10e, the Galaxy Buds are optimized to work with these handsets, much like the Apple AirPods (2019) are optimized for iPhone, linking strongly to dedicated Siri or Bixby features, for instance – however, both sets of true wireless buds can be used with any smartphone. The new Apple AirPods (2019) cost $159/£159/AU$249 with the standard charging case, and $199/£199/AU$319 with the new Wireless Charging Case bundled in. This is the same price as the originals, which are no longer being sold by Apple, but should be available from third-party retailers while stocks last. It's worth keeping an eye out for AirPods deals if you're not interested in the new wireless charging case or marginally faster pairing times, as we've seen some decent reductions since the updated models came out. You can also purchase the wireless charging case separately for $79 / £79 / AU$129, which is good news if you have the original AirPods but want to upgrade your case to one that supports wireless charging, although you might feel it’s a high price to pay for some added convenience. Samsung don't charge you any extra for this convenience, as the Galaxy Buds' wireless charging case comes as standard. The Samsung Galaxy Buds slightly undercut the price of the AirPods (2019) at $149 (£139 / AU$249). You can get some of the best true wireless earbuds for less of course; the Optoma NuForce BE Free5 wireless earbuds show just how accessible truly wireless headphones are today, costing $100 (about £75, AU$134). The Apple AirPods (2019) have a very distinctive style, which you will probably either love or hate, essentially taking the classic EarPod design cutting the cables, leaving the stem of the bud to hang out of the ear. It’s interesting that Apple hasn’t changed the design of the earbuds themselves in 2019; after all, those stem-like protrusions were widely mocked upon their original release in 2016, and they don't do the headphones any favors in 2019. 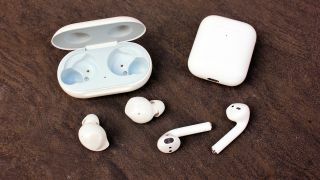 Like their predecessors, the AirPods (2019) draw battery from a pillbox-like charging case, which features a small LED light on the front, which allows you to check the charge status of the buds. True to that rigid Apple design, you won’t find the convenience of replaceable silicone eartips, and although they felt relatively snug when we tested them, we’d think twice before wearing them while working out. Like we say, it's a 'love it or hate it' kind of design, and if you are a fan of Apple's clean aesthetic, you'll probably like the AirPods (2019). The Samsung Galaxy Buds on the other hand, have a more ‘classic’ true wireless earbud design (if such a thing exists), with all the tech built into their pearlescent housing, unlike the AirPods (2019), which pack all their tech into the stems. Overall the Samsung Galaxy Buds are quite dainty, and feel pretty secure thanks to the inclusion of rubber wingtips. In our opinion, they are the more aesthetically pleasing of the two models, but it really comes down to personal taste. Both earbuds have touch controls, which means you can summon your phone’s respective voice assistant (the AirPods can summon Siri on iPhones, while the Galaxy Buds summon Bixby on compatible Samsung phones), play/pause your music, and answer and end calls. Connectivity has always been a bit of a sticking point when it comes to true wireless earbuds, but both the Apple AirPods (2019)and the Samsung Galaxy Buds pair seamlessly – as long as you’re using a smartphone in the same family. The AirPods (2019) pair even more quickly than their predecessors, thanks to a newly-designed H1 chip which Apple has built specifically for the headphones. If you’re using an iPhone, an option to pair the AirPods (2019) will appear on your phone screen as soon as you open the charging case, as well as the battery status of the AirPods and the charging case. While the Galaxy Buds generally connect very well to Samsung phones, their connectivity seems to vary between different users; multiple writers on the TechRadar team tested the buds, and while some experienced no connection dropouts, others experienced them regularly. Most of the issues with connectivity seems to have been addressed by a software update sent out by Samsung, but as with most true wireless buds, you may experience connection dropouts if you are using them nearby other Bluetooth devices. While Apple AirPods don’t come with their own app, the Samsung Galaxy Buds have the Galaxy Wearables app, which allows you to change the EQ settings, and turn on features like ‘ambient sound’. This lets some environmental noise pass through the earbuds – handy if you’re cycling or running and need to be aware of traffic. This app is only available on Android phones so if you want features like this and you have an iPhone, you’re going to be disappointed – aside from easier connectivity, this could be another reason to stick to the AirPods if you have an iPhone, and vice versa if you have a Android phone. The Apple AirPods contain five hours of battery life in the buds themselves, and the charging case offers a further 20 hours of power on top of that. Apple also says that the second-generation model offers “3 hours of talk-time from a single charge”, up from the two hours provided by the originals. The Samsung Galaxy Buds at least beat the AirPods (2019) in this regard, with six hours built into the buds themselves – but the charging case only provides an additional seven hours of battery – a measly amount compared to the AirPods' 20. If you have the original AirPods, you can still buy the case separately and enjoy the benefits of wireless charging. Of course, if you get the AirPods 2 with the wireless charging case, it will cost you around $40 more than if you bought them with the standard charging case. Samsung puts no such premium on its own wireless charging case, which comes with the Galaxy Buds at no extra cost. Both wireless charging cases can be used with a Qi-compatible charging mat, but the Samsung Galaxy Buds have another trick up their sleeve: if you have the Galaxy S10 phone, you can set up two-way wireless charging and place your headphones on the rear of the device to get them charged up as well. It’s smart, and we found it to work seamlessly. True wireless earbuds get a bad rap when it comes to audio performance, but they are getting better all the time – and the AirPods (2019) and Galaxy Buds are good examples of this. In terms of audio quality, the AirPods (2019) have a lively, powerful presentation, although they can sound slightly harsh when it comes to higher-frequency sounds, and they aren’t the bassiest earbuds on the market. If you’re a true bass-head, you might prefer the Galaxy Buds, which have a warmer, and generally more bass-heavy soundstage. Neither of these buds will offer the same kind of audio prowess that a really good pair of over-ear headphones will, but you do get the freedom of wireless connectivity in exchange for a slightly less powerful sound. It’s difficult to give a definitive answer to the question of which is the better true wireless earbud. Both the Apple AirPods (2019) and the Samsung Galaxy Buds have plenty of good (and less good) features, and at roughly the same price, there’s not a lot in it. If you have an iPhone or an iPad, it’s likely that the AirPods (2019) will suit you better than the Galaxy Buds, with hands-free access to Siri and fast connectivity. Likewise, if you consider yourself a Samsung fan, the extra features afforded by the Galaxy Wearables App means that the Galaxy Buds are probably the smarter choice. That’s not to say you can’t use either model with any smartphone you want – you absolutely can, you just might find the buds don’t connect quite as well as if you use them with a device in the same ecosystem. It’s also worth noting that there are lots of other brands making true wireless earbuds these days that may suit you better than either offerings from Apple or Samsung. In fact, our favorite pair of true wireless earbuds are the RHA TrueConnect True Wireless Earbuds, which are the same price as the Galaxy Buds, and offer a balanced, detailed sound, and a reliable Bluetooth connection.